Revenue cycle automation technology can help hospitals gain better control of the conundrums that are charity care and bad debt. According to the Healthcare Financial Management Association’s publication “Revenue Cycle Strategies and Technologies for Serving the Underinsured,” more than 46 million people in the United States are without health insurance, and an additional 16 million people are underinsured. With these numbers in mind, hospitals frequently find themselves in a situation of providing uncompensated care. As a result, these facilities are seeking technology solutions to address these changing service needs. Ken Moody, MHA, CFHP, an executive consultant at Beacon Partners, a healthcare management consulting firm in Boston, says charity care and bad debt are placed under the umbrella of “uncompensated care. Charity care is given to those who are unable to pay, whereas bad debt comes from patients who are deemed able to pay but are unwilling to,” he says. Collectively, uncompensated care must be reported to the Internal Revenue Service (IRS). From the accounting side, the difference between the two is that charity care is an adjustment to revenue taken off the top line, whereas bad debt is seen as an expense. “It doesn’t affect the bottom line. … It’s a wash, but most hospitals prefer to have charity care. Most hospitals are a 501(c)(3) classification with the IRS, which means they serve a charitable purpose, and they don’t pay income tax. So they prefer charity care to show they are there for the community and, in return, gain a big economic advantage,” says Moody. He notes that not-for-profit hospitals are the only ones with the 501(c)(3) exemption from federal income tax, whereas for-profits pay income taxes. In short, it means 501(c)(3) hospitals would like to demonstrate more charity care, but for-profits do not. For-profits have no incentive to grant charity to a patient, even though they still do, whereas not-for-profits have financial and marketing incentives to do so. Moody says hospitals use technology in two ways: taking the system’s determination of a patient’s insurance status and using it as a “preapproved” determination or using the tool as a screening mechanism that helps make a determination based on the information provided by the patient. Often, patients present no tangible documentation to verify that what they are reporting about their insurance status is true. Using a system to screen the patient could improve the determination process. Technology can also be the catalyst behind a system that verifies information such as credit and addresses. Hospitals have struggled in regard to who qualifies for charity care. It is up to them to specify what meets the criteria for charity care vs. bad debt. A big factor in the decision is looking at the patient’s percentage of income compared with federal poverty guidelines. According to Moody, there is a push within the industry to liberalize charity care policies. Automating the revenue cycle helps to speed and streamline the process by collecting data at the point of service, which can better clarify whether patients should be charity cases. Moody says that with an eligibility determination tool, facilities can input parameters to help determine patient classification. In addition, at that juncture, it is also easier to identify those who qualify for programs such as Medicare or Medicaid. Connie Tohara, RHIT, national compliance manager at Kforce Healthcare Staffing, notes that automated revenue cycle tools provide different benefits when used on the front or back end. Some front-end tools allow hospitals to determine whether patients are eligible for financial aid. “A big issue on the front end is knowing the patients’ financial status and their likelihood to pay. Front-end tools allow hospitals to check credit and see where patients are in their ability to pay,” says Tohara, who says they also identify patients at risk for nonpayment. The organization and patient can then review their options, which in many states is based on set standards. For example, California regulation AB774 requires hospitals to notify patients that it has a plan to assist the underinsured, allowing patients to choose whether they want to explore potential financial assistance options. In Illinois, there are laws designed to increase hospitals’ responsibility to help patients. These regulations are critical because the IRS grants tax-exempt status based on the amount of charity care a facility provides. The Sarbanes-Oxley Act of 2002 requires accountability for hospitals regarding charity care. In the past, before automated revenue cycle tools, the way charity care was managed made healthcare organizations potentially vulnerable to lawsuits from underinsured patients who could claim they were charged differently than other patients. However, revenue cycle tools can help hospitals document that they are not discriminating by providing a record of every transaction, proving that all patients are treated in a systematic way when it comes to charges. “That’s something you can’t prove without a tool for tracking. It protects facilities because it can show the transactions through audit trails and reports,” says Tohara. In financial terms, automating the revenue cycle allows facilities to better capture the transaction as close to the event as possible, especially in the case of charity care. Still, charity care and bad debt present two different scenarios. “Without using RCA [revenue cycle analytics], you might have a heavy charity month, so accounting will reduce revenue for that month, but the actual event might have happened three months ago, which makes the bookkeeping look odd month over month but usually balances out over the year,” according to Moody. Conversely, using the tools, finance has a more accurate picture of the true financials in a more timely manner. For bad debt, Moody explains that facilities typically don’t book it in the same month as care was provided so the patient has time to pay, thus creating a lag that doesn’t frequently occur in charity cases. In addition, many tools can project payment and give administrators forecasting ability. This makes budgeting easier, allowing hospitals to be more effective in managing their programs because they have more information when planning. Other tools can improve communication between the hospital and one-time patients by providing real-time status and information regarding the account. This feature allows customer service personnel to work with those patients in a more timely manner. By improving communication and providing patients with the most up-to-date information about their account, the likelihood of payment increases, and patient frustration decreases. Timeliness of account management is critical because if the claim becomes too old and can’t be filed in time, it turns into bad debt. Tohara also notes the value of collecting what you can from presenting patients at the time of service. “If you have the information up front, you can use revenue cycle management tools to estimate charges and generate a copay amount and collect those funds up front. If a patient is high risk for nonpayment or underpayment, that may be all you are ever able to collect,” she says. From a workflow standpoint, automation helps prioritize the next action that should be taken when registering patients and determine their ability to pay. It gives staff the opportunity to trigger that next action by sending a prompt and relaying a work list. Automated revenue cycle tools also help hospitals get patients to follow up with applying for financial assistance. “Unfortunately, when you tell people there is charity care available, they don’t always bring in the documentation to apply for it, and they let the account go to bad debt because they don’t want to engage in the process,” Moody says. 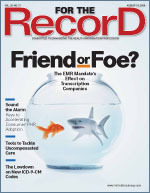 “Sometimes, they will start out with the appropriate documentation, but then they discontinue doing their part in the process and don’t follow through.” It puts the onus on the hospital rather than the individual by making the organization proactive in getting the patient into the program rather than just letting the account go to bad debt, he adds. Moody says that in his experience, most hospitals know the accounts they write off to bad debt ought to be charity care. But if patients don’t apply for charity, there isn’t enough information to decide one way or the other, so the hospitals must assume the patients are unwilling to pay. Nonetheless, hospitals want to provide more charity care. “Bad debt is not a good thing. Hospitals want bad debt to decrease and charity care to increase,” says Moody. However, if a community knows a facility is liberal in giving charity care, he warns that it might draw people to the emergency department (ED) rather than a private physician for treatment. However, charity care is generally better for a not-for-profit organization. Tohara has found that patients who present at the ED for treatment are more positive in terms of willingness to pay at that point. If patients do not pay before receiving care, they are less likely to pay afterward. Therefore, capturing payment ahead of time is important. On the other hand, she’s seen many cases in which the uninsured or underinsured become less positive and verge on being cynical regarding the care they receive after the initial visit. “If some little thing goes wrong, they tend to come back and say ‘I’m not paying’ because they were looking for a reason not to pay all along,” she says. Tohara points out that the credit card industry annually writes off between 4% and 6% in bad debt, whereas in healthcare it can be as high as 25% to 30%. “The healthcare financial system is not efficient in many ways regarding the management of uninsured and underinsured patients. The more tools hospitals have to manage cases of patients with poor insurance is really important,” she notes. All in all, automating the revenue cycle improves financial performance by identifying and quantifying charity care while aiming to reduce the incidence of bad debt. “The intangible benefits are that it shows you are helping the community, and it also has a serious direct financial impact because as a 501(c)(3), there is no income tax, saving possibly millions of dollars across the board by offering charity care,” says Moody.